An Indian Christian has suffered a brain haemorrhage after he was interrogated by police about his role in distributing Bibles and other Christian literature in the city where he works as a professor of engineering. K.A. Swamy, 47, was marched to the police station at around 10am on 21 January by a group of angry locals, who found him distributing the literature near the Hussain Sagar lake in Hyderabad, the capital city of the southern state of Telangana. He was close to the Kattamaisamma Temple, dedicated to a Hindu local deity of Telangana; and the locals accused him of trying to convert people in the temple area. He was released six hours later, but suffered a brain haemorrhage on his way home. He is now in a coma. His wife, Sujatha, said there has been no change in his condition since 21 January and asked for prayer. The state government has promised to cover his medical expenses after local Christians approached the state Home Ministry for help. His brother-in-law told World Watch Monitor: “Several times in the past also he has been caught by extremists from Vishwa Hindu Parishad [a Hindu nationalist group] and has been threatened. He has also been taken to the police station for verification many times before. This time he just couldn’t take it. 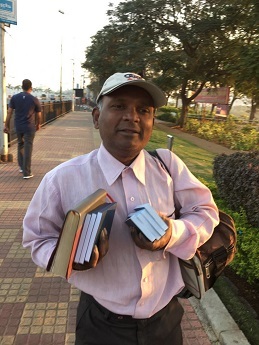 Swamy, who has two daughters, volunteers for Gideons International, a Christian organisation which distributes Bibles (free of charge) around the world. From the police station, he had called the President of the local Gideons group, who helped secure his release. A short video (below) has been circulated widely on social media, showing Swamy being questioned by locals about why he distributed the Christian literature. A local source told World Watch Monitor it is thought to have been filmed by Vishwa Hindu Parishad members, who wished to use it as evidence that Swamy had been guilty of evangelising. Several Indian states have laws prohibiting evangelism: so-called “anti-conversion laws”. These laws – named “Freedom of Religion Acts” – are officially there to prevent religious conversions being made by “force”, “fraud” or “allurement”. But Christians and rights groups say that in reality the laws obstruct conversions generally, as Hindu nationalists invoke them to harass Christians with spurious arrests and incarcerations. Such laws are currently in force in five states – Madhya Pradesh, Chhattisgarh, Odisha, Gujarat and Himachal Pradesh – and have been discussed in several others. In 2015, two members of the ruling Hindu nationalist BJP – one in the Lower and one in the Upper House of the national Parliament – planned to introduce a Private Members’ Bill, each in their respective House, to introduce a national law against conversion from Hinduism, which would then force a debate in the Parliament. The MP in the Upper House, Tarun Vijay, said the recently released census had indicated that, “for the first time, the population of Hindus has been reported to be less than 80 per cent”. The MP in the Lower House, Yogi Adityanath, a senior BJP legislator, Hindu head priest and founder of Hindu Yuva Vahini – a social, cultural and nationalist group of youths who seek to provide a right-wing Hindu platform – said in June 2015 that those opposing yoga and Surya Namaskar, a Hindu salutation to the sun-god within yoga, “should leave India or drown themselves in the ocean”. One of the most prominent trends in the recently-published 2017 World Watch List was the rise of Hindu nationalism in India since President Narendra Modi came to power in May 2014, and its impact on the lives of the 64 million Christians there. India climbed to no. 15 on the List, compiled by the global charity Open Doors, of the 50 countries in which it’s most difficult to live as a Christian. A companion report to the List (published by Open Doors UK & Ireland) says that, while out of power during 2004-14, Hindu nationalists “used that time assiduously… Over 600,000 Hindu nationalists were trained to run schools with the object of radicalising families. Now there is an average of around 60 incidents a month: pastors are beaten, converts harassed”.